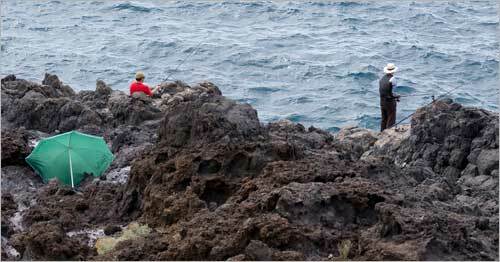 A Tenerife fishing licence is required for everyone who wants to practice their favorite sport on the island. 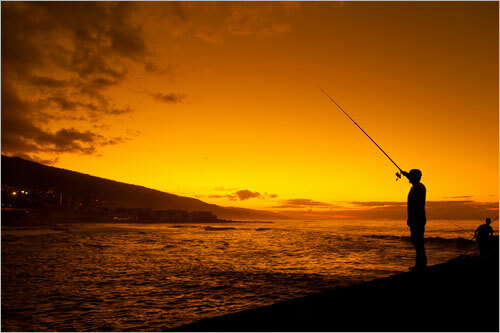 You will also be able to go fishing on all the other Canary Islands, and it is valid for 3 years. Not only can you catch fish, but you can also eat it fresh, although most tourists choose to do "catch and release", if they don't have a kitchen in their hotel or apartment. Shore fishing licence: This is the most common of all, and allows you to fish from the shore around the island. You can also fish from a boat, with your fishing cane (no trolling). The cost is 40 euros, and turnaround time is a couple of days. Boat fishing licence: This is ideal for those who want to do trolling. The cost is 60 euros, and turnaround time is a couple of days. Spear fishing licence: This is for those who want to dive, and fish. Unfortunately, it can’t be done online, because a Spanish doctor’s certificate is needed. The reason we say “Spanish doctor” is because the certificate needs to be in Spanish language. You can bring a foreign doctor’s certificate, but it will be of no use, until a certified translator has translated it to Spanish language, which at the end of the day, is slower, and a costlier process. We have an online fishing licence service, to save you time and the hassle of going to the fishing office, and banks. To order your fishing licence, all you have to do, is fill out the handy form below, and hit the Paypal button when prompted. If you prefer to use another form of payment, please contact us, and we will be happy to accommodate. You will also need to send us a scanned copy of your passport, as well as a signed authorization, so that all the paperwork can be done on your behalf. If you want to fish from a boat and do trolling, this license is for you. Where else can I use this licence? Good news: your shore fishing license is also valid, for shore fishing throughout Spain. Please check minimum sizes, fishing quantity limits, banned species, etc. with each autonomous government of Spain, as each one has different rules and regulations. This license is not valid for fishing in lakes or rivers. When shall I order my licence? Ideally, around a week (or ten days) before arriving, is the best time to order, to maximize the total validity period of the licence (3 years). You’re free to order before, if you wish. How will I receive my licence? Since licenses are issued on normal pieces of paper, we will scan it, and send it to you by e-mail. Then, you can print it out on your end, cut it out, and laminate it. While fishing, always remember to carry a photocopy of your passport, with your license, so that officers can compare the number on both. Yes. Volume discounts for more than one license are available, so that you can bring your friends with you. Is my licence valid on other islands? Yes. The licence is valid for a period of 3 years, on all the Canaries. The only place it isn’t valid for, are the Gran Canaria inland lakes. For fishing there, a separate license is needed. Why is your licence service so expensive? Why do you need my passport/ national identity card? A copy of this has to be submitted to the fishing office, so that they can see the passport or national identity card number, and put it on the license. I’m worried about sending you my passport/ national identity card. What do you do to protect me? As soon as we receive your passport, we print it out. Then, the e-mail containing the file, is deleted from the inbox, and then again, from the “trash” folder. After that, the passport or ID file is also erased from our computer. Please make sure that you also delete the e-mail, after you send it. You will find it in the “sent” items folder. Then, go to the “trash” folder, and then delete it again. In the video below, you can the French Angler picking up a fight with a barracuda in Tenerife. These local fishermen are delighted to see the size of the parrotfish. They did fish bigger ones in the northern area, but didn't have the camera ready.